Unlike chemical disinfectants like chlorine and chloramine, ultraviolet does not provide a residual protection: UV disables microbes as they pass the germicidal lamp, but if there is microbial contamination downstream of the UV lamp, bacteria can continue to grow. It is necessary, therefore, to disinfect house pipes with chlorine when a UV unit is initially installed or when for any reason infection of the home’s pipes occurs. 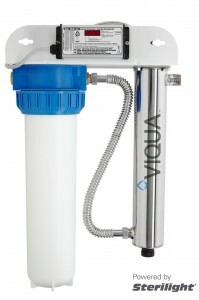 With most UV systems, the easy way to add chlorine for disinfection is to remove the cartridge from the filter housing, pour bleach into the housing, turn on the water and let the bleach circulate past the UV unit into the house pipes. Chlorinate the house lines by opening each faucet in the home and letting the water run until you smell chlorine coming from the faucet. Do this for every showerhead, toilet, outside tap, and appliance. Start with the farthest away tap and work back to the UV system. Repeat for the hot water lines. If you run out of bleach (or cannot smell bleach) at a given outlet, turn off the main water supply and add more bleach to the filter housing. Give the chlorine time to work. Let the chlorine sit in the pipes for at least two hours. Turn off the water, replace the filter cartridge, turn on the UV (this is important! ), turn on the water and flush the chlorine out of the house lines. When the chlorine is gone, you can start using the water. When to repeat the procedure. This process should be repeated if contaminated water ever gets past the UV system. After seasonal shut-off; after UV by-pass is used; after power outage, if no solenoid present; after prolonged alarm condition, if no solenoid is present. You can safely skip this procedure if you are installing UV on municipal water that has been continually chlorinated. If performing the above procedure fails to produce a “passing” bacteria test, the first thing to suspect is that your house plumbing has “dead ends.” This would be pipes that have been capped off so that there is no water flow through them. If such dead ends exist, you may have to open them so that chlorinated water can flow through during the disinfection process. Sometimes hot water heaters require more disinfection time than standard house pipes because buildup of such contaminants as manganese and iron can interfere with the disinfection process. Keep in mind that with sophisticated UV systems which monitor UV transmittance, excess chlorine in the water can actually trigger a low performance warning and, if the unit has a solenoid, can actually shut the water off. In this case, you will need to override the solenoid to perform the disinfection procedure.